From President Obama’s historic visit in March to the recent passing of former President Fidel Castro, the small island nation of Cuba has made big headlines in 2016. With great strides made toward restoring US diplomatic relations with Cuba, the need and opportunity for educational collaboration between the two nations has never been greater. The School of International Service’s Education Diplomacy: Building US-Cuban Educational Partnerships Practicum Program sent nearly a dozen School of International Service (SIS) graduate students to Cuba this summer to research the collaborative potential of US and Cuban higher education institutions and consult with three real-world clients: the American Association of State Colleges and Universities (AASCU); NAFSA: Association of International Educators (NAFSA); and the Institute of International Education. Following this summer’s trip, three students from the program were asked to present their findings at their clients’ national meetings this fall. Intercultural and International Communication students Alanna Casselle, SIS/MA ’17, and Hannah Olivieri, SIS/MA ’17, consulted for their client, AASCU, during the practicum and presented to a group of university presidents at AASCU’s national meeting in November. United States Foreign Policy and National Security student Priyanka Vakil, SIS/MA ’17, consulted for NAFSA with her team during the practicum and presented in September at the NAFSA Cuba Engagement Forum. 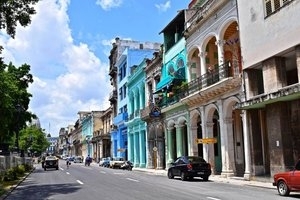 “While there are plenty of universities and programs offering short-term trips to Cuba, there are very few, if any, that offer students the opportunity to gain professional experience in transnational education partnerships on the ground,” said Casselle, referring to the unique structure of the practicum. In supporting AASCU, Casselle, Olivieri, and their team conducted interviews with Cuban university faculty and staff, collected data on existing programs between US and Cuban universities, and drafted a white paper of recommendations for US universities. Casselle and Olivieri discovered that the cost of higher education in the United States is one key factor, among many—including the US embargo and immigration policy towards Cuba—that inhibits Cubans from studying in the US. They note that since tertiary education is free in Cuba, “funding models must be built” into Cuba-US educational exchange programs if they’re to become more viable. Moreover, they see online models of exchange as cost-effective alternatives to the country’s current models, as long as Cuba builds more information technology infrastructure. Vakil, who served as her team’s primary Spanish-language researcher, worked with her team to develop a matrix for her client to assess how prepared Cuban higher education institutions are for new international academic partnerships. While the students each gained a unique skill or takeaway relevant to their individual careers, one of the main goals of the practicum is to build intercultural communication skills, which—according to Professor Amanda Taylor, the practicum’s faculty advisor and director of the Intercultural and International Communication program—is one of the most highly sought-after skills in today’s intercultural workplaces and economies. Learn more about the SIS Practicum Program.